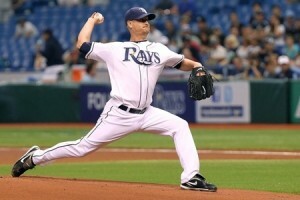 According to Marc Topkin of the Tampa Bay Times Alex Cobb is set to come off the DL and will start Thursday against the Seattle Mariners at Tropicana Field. Cobb made his third rehab start (first one cut short after two pitches due to a blister) for the High-A Charlotte Stone Crabs against the Fort Myers Miracle working 4.1 innings allowing 3R/ER on five hits striking out five and walking two last night. Cobb has been on the DL since being struck in the head by a line drive off the bat of Eric Hosmer of the Kansas City Royals on June 15th. He was Cobb (6-2, 3.01 ERA) at teh time of the injury and one of Tamp Bay’s most consistent starters in 2013.